Thomas Piketty, a French economist with a message. 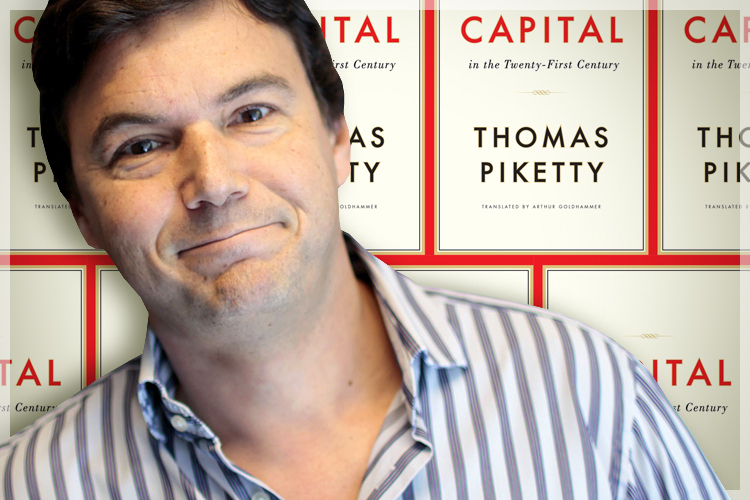 With everyone talking about Thomas Piketty's new book Capital, I wanted to shed a little light on the issue that Piketty is so concerned about. A lot of commentators have viewed Piketty's work within the traditional media narrative of liberal vs conservative, collectivism vs individualism, redistribution vs incentives. I think this is entirely the wrong way to read Piketty's thesis. Suppose we have an economy populated by a large number of households who are finitely lived but value their offspring, so that they have a motive to leave bequests. To really illustrate the point about capital and inequality, we'll pretend that there's no labor, so that capital is the only input into production. So the only way people can feed themselves in this economy is by investing enough capital to produce a dividend to live on--that is, they must invest enough capital this period so that they have stuff to consume next period, in addition to having capital left over to invest again. Households desire consumption and are risk-averse (ie, utility is monotone increasing and concave). However, investment is risky--each unit of capital invested has some non-zero probability of defaulting in which case the investor looses both the net interest and the unit of capital invested. Though it's not a necessary assumption, we'll assume that everyone is equally skilled at investing and that all investments are equally risky, so that the only source of heterogeneity in this economy is the initial endowment given to the initial generation in each family line. Finally, we'll assume that the performance of households' investments are private information, and that households are free to trade with each other to insure themselves against investment risk. It turns out that in this model inequality rises without bound over time. Eventually, one single family dynasty will own literally all the capital--probably the one that started with the largest initial endowment but this is not guaranteed--and all other families will go extinct, starving once their capital stock drops to zero. Without some form of market intervention, this result is inevitable. This result is known in the literature as "immiseration" and it is highly robust across a wide swath of different kinds of models. The intuition is this: individuals are risk-averse and therefore willing to trade away a portion of their capital stock to insure against the riskiness of their investment. But, that riskiness is a much bigger problem for poorer households than rich ones, so the poor are willing to trade away a larger share of their wealth for that insurance--hence, the single richest household can't really insure it's risk, but can profit by offering insurance to everyone else. Over time these insurance contracts transfer an ever larger share of wealth to the winning dynasty, but leaves everyone else with less and less to invest in the future. And the smaller their investment portfolio, the greater the probability they will loose everything next period and have absolutely nothing to trade or produce in all future periods. In this economy, there is a return on capital r>0, but no intrinsic economic growth (g=0) because technology is constant and there are no additional endowments of capital after the initial period. Hence, r>g, illustrating the point in Piketty's new book--with interest higher than economic growth, inequality rises without bound. If we altered these assumptions and allowed for growth by, for example, having technology improve each period so that it takes less capital input to produce the same output, then a large enough growth rate would offset the losses households experience from the riskiness of the investments (in essence, a technological improvement would be functionally equivalent to an endowment of extra capital, which is why it can stave off the eventual starvation of dynasties so long as the pace of these extra "endowments" is larger than the rate at which dynastic wealth decays). Hopefully, this illustrates some of the theory behind Piketty's r>g proposition and its implications, and also convinces you that this is an empirical question ("Is r>g?") not a political one ("Should we care if almost everyone starves to death?"). [*] To see why my formulation is analogous to Atkeson and Lucas (1992) and the many similar papers, note that the essential aspect of my model is that because utility is concave and investment is risky (with realizations being private information), households' marginal utilities of consumption are stochastic and also private information. Here's a simplistic model that shows similar, and with similar assumptions. Concave utility implemented via declining marginal propensity to spend/consume out of wealth. Also shows the results with different levels of upward/downward redistribution or income share. You said that poorer households are willing to trade a larger portion of their wealth away to insure against default. Intuitively this seems spot-on since a concave utility function guarantees declining absolute risk aversion. However, in trying to understand this intuition better I reviewed part of Chapter 6 of MWG. Example 6.C.1 provides a proof that any risk-averse agent will, if insurance is actuarially fair, fully insure. However, if the price of insurance is the same across households, then all households regardless of wealth will be willing to trade away the same fraction of their initial endowment. I'm only a first-year so I was hoping you could tell me where I go wrong here.